The subject for this diorama is one I have always wanted to do, but was a bit wary about doing it because of my concerns in regard to creating the snow effects. However after the research I did for the Russian diorama, it was a little easier although this time I went for a sleet effect. The first thing the purists will say is that the soldiers’ uniforms are in such good condition and they would be correct. The soldiers and officers alike would have suffered greatly in the terrible conditions of cold, rain and snow, but it is difficult to turn the figures that are manufactured as if they were on parade into a ragged a condition using a scalpel and paint to mimic reality. The retreat itself was quite an amazing feat and some have put it alongside Dunkirk in regards to it’s success, as to extricate an army from certain destruction is never easy. I had originally seen a popular painting on this subject (type in retreat to Corunna and check images and you will see this pop up all the time) so again, the clever ones will see where the idea came from and I’ve loosely based my diorama on this scene with a few additions of my own . The painting of the 268 figures took some time as most are the Scots are in their kilts, a bit of a challenge, with the effort being somewhat lost in the end on such a small scale, a lot of fun though. Trees, now they have always troubled me. To get them to look realistic has been a bane in my diorama career, their either too big or too artificial looking or both. But fortune has shined on me twice during this project, firstly with trees and then with rooves . The trees are courtesy of one of my followers The Imperfect Modeller who has a nice and simple method of making a tree that I have employed on this project and again the terra cotta roof method by Skarlocs, both have helped greatly. As an aside I will say here that I have a very friendly and helpful mob that do this hobby, and your advice and tips are greatly appreciated, thank you . I have to point out that TIM’s trees are the pine and firs, the bare ones are just armatures that I stuck fine twigs onto, time consuming, but the pressure to do it from the Tech adviser certainly was worthwhile, just adds a little to the bare trees . Well I have thanked my followers, so I should also give a big thankyou to the guys that make it all possible, the people that make the figures for us. 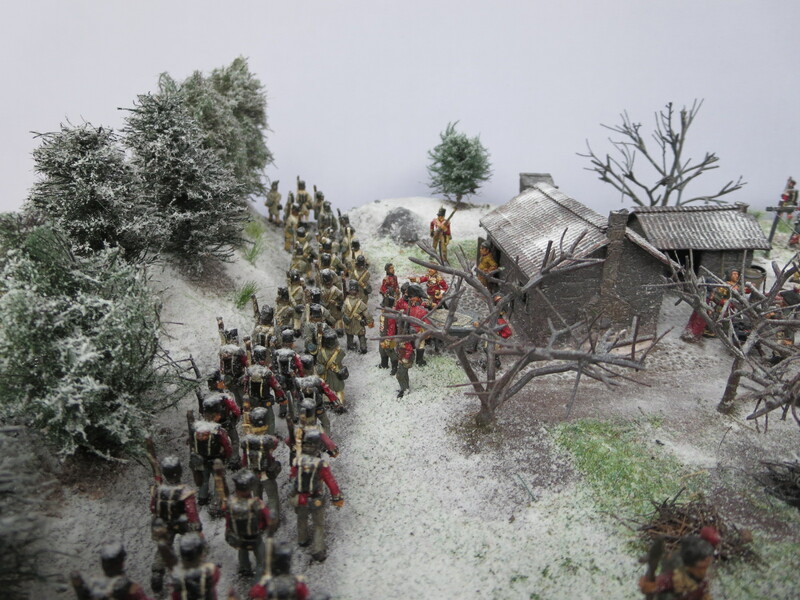 I usually don’t like marching, standing figures in a set, but when I saw our friends from Strelets making whole sets I saw the opportunity to do this diorama and the Moscow diorama . The figures are 90% Strelets, with the 10% made up of my old friends from Airfix, a little Italeri and a special mention to Valdemar Miniature who provided me with some of the civilian women and children and lastly Ultima Ratio for their two ladies . Stunning Pat, simply stunning. Obviously the trees make it! Only joking but glad you felt it made a difference. The figures look great and how you had the patience to paint them all I’ll never know. I guess there can’t be much to do in the Outback! The snow has worked well and you’ve captured a moment in time perfectly. The buildings look brilliant as well. Great work mate and shall be interested to see what you decide to do next. Perhaps you’ll be inspired by something when you visit the UK in a few weeks. Thumbs up to Tech adviser too. Sorry I missed your comments on the Corunna dio mate ,I don’t know what happened there ! .Well the trees certainly helped a lot ,I had a different base I made at the start but it wasn’t quite right and the tree I had bought looked ,well a bit fake . I was just fortune that you had put this post up and I spotted them and ,bingo! , the answer to my dilemma was right there . Thanks to your blog I have since found out I am the Nerd ! ,once I’m shown how to do something I want to make heaps so I can pick out the best one to suit the job ,it was when I was doing this , that the idea came about using your method to make them .I’m doing an English civil war one next ( painting heaps of horses at the moment ) and I want to have hedges ,and small trees in it and as I’m the Nerd I will be in the hedgerows studying whilst the wife checking out the historical building with all the other tourists near bye! . It’s that bad I have asked John (JNV ) to check out any that are worth visiting ,nahh ,I just said if he sees any to put up a photo on his site . I had to point out the difference between constructive criticism, and nit picking when Tech adviser , pointed out I didn’t have enough bloody twigs on the larger bare trees . The other thing was the snow ,your use of hairspray ,brilliant !,spray the area/ people with it and give it a dusting with bicarb , bloody marvellous ,thanks again for the tips mate . I can’t take all the credit for any of the tips Pat as they are were all passed to me at some point. I put my own spin on some of them as you have too. I guess what did prove handy was the timing of the post, lucky for me because it went down well and fortunate for you as it provided a solution. It’s funny how things come along like that and I know I have benefited from tips from others and will continue to do so I’m sure. Keep up the great work and I’m looking forward to seeing the next one you do along with all about your UK trip in due course. Nothing wrong with b3eibg a Nerd! Brilliant, Pat! It is just SO atmospheric! I think you’ve got the snow absolutely spot on for a light/sleety covering! Am going to have to keep coming back to look at all the detail! Thanks mate , I really wanted to get a cross between snow and sleet and came up with a combination of woodlands snow and a dusting off bicarbonate of soda . the reason being is TIM gave me the idea with his tree method which to use hairspray to set the fibres in the trees ,absloultly brilliant .I CAN’T wait to get to UK to check out the hedgerows for the next dio . The civil war . the last time I into stone walls ,but I see it featuring at this stage . Rgds P .
I’ve yet to try TIM’s trees (catchy) but between you you’ve come up with some impressive ones! New project sounds good – don’t think I’ve heard anyone say they’re visiting the UK to check out the hedgerows! If I’m out and about and see any impressive looking ones I’ll try and get photos if I can! Love it mate , I feel we modellers look at the world a in a slightly different way than the norm ,which I feel makes us such happy people ,eh !. Photos would be great ,Don’t call me fussy but ones with Hawthorne in them are my favourite . It must be my English ancestry coming ,as Bill Bryson says in the book I’m reading at the moment ” only the English would have a round about enthusiast club “.Forgive me John, if you are a member ,but as I was saying to TIM the other day they are very plentiful there , and a little daunting ,if one isn’t sure where one is going . Thanks mate , well spotted ,I do like a man who knows his figures !. Woah man! That`s impressive, so real… perfect! Thanks mate , I certainly got a lot of pleasure out of doing this one ,and getting the snow right was good .I felt the Moscow one wasn’t quite what I set out to achieve ,but it did teach me a lot . Thanks mate I used to buy model buildings but they were never really what I wanted so I’ve now turned to scratch building .I couldn’t work out what roofs until I saw a model of a Spanish church done bye a guy called Skarloc and bingo problem solved.